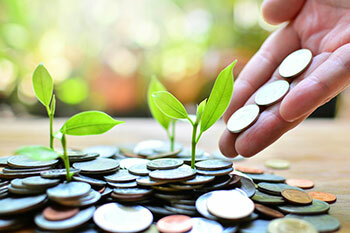 A financial plan is a great place to start your wealth creation journey. It helps you start slowly and build gradually. At a recent family get-together, a distant relative asked me about the ‘best investment options’ in the market. The focus was on the ‘best’ part. “This is a good question but do you have enough insurance”, I asked her! The best investment that one can make is investing in their family’s financial protection in the unfortunate situation of a sad event. Looking for ‘best’, ‘the most profitable’, or ‘the easiest’ investment option is, unfortunately, a fallacy. This question arises because people lack the knowledge about various investment options available. Luckily, there are diverse options within a few clicks and taps and investing in them is getting easier each day. One must start by getting organized and learning more. There is no denying that financial planning and asset allocation are the keys to building a robust portfolio. Start with a ‘financial risk appetite assessment’ and invest based on the findings. The exercise allows you to identify the asset classes mix you can have in your portfolio. For instance, a young investor with a 25-year investment horizon might come across as an aggressive investor who is comfortable with a portfolio with 80 percent equity, 10 percent debt and 10 percent cash. The investment strategy is also based on the risk appetite. For example, strategic asset allocation in stocks, bonds and cash is maintained to meet long-term financial objectives. On the other hand, tactical asset allocation involves short-term deviations to leverage market conditions. For instance, the equity portion in the above portfolio could be branched by investing 50 to 60 percent into small-caps or mid-caps (to realise short-term profits), while the rest can remain in large-caps. The third strategy, dynamic asset allocation, takes advantage of changing market conditions by regularly rebalancing the asset allocation in a portfolio. Some unit-linked insurance plans, for example, use the dynamic asset allocation model to maximize returns in a conducive market. Another aspect that investors need to be clear about is guaranteed, partially guaranteed, and non-guaranteed returns. For example, instruments like PPF and fixed deposit plans offer guaranteed returns, endowment plans offer partially guaranteed returns and products like mutual funds (that are market-linked) offer non-guaranteed returns. Yet, every product has its rightful place in a financial portfolio. Investors need to be mindful of choosing the right product based on the nature of the goal. For example, if you aim to build a corpus for your child’s higher education, you have a definite horizon and might not want to depend on a product offering non-guaranteed returns. 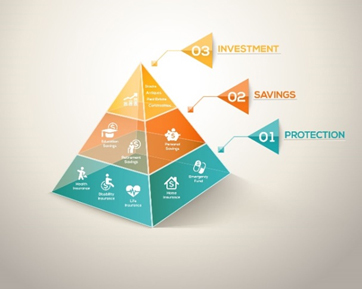 Just like the Maslow's hierarchy of needs has the most basic needs at the bottom, Protection forms the base of a financial planning pyramid. Start by investing in a pure protection plan for safeguarding existing assets. This means your health (buying a mediclaim and critical illness insurance for yourself), your life (buying a term life insurance), and then your assets (insurance for home, vehicles, etc.). Keep reviewing your needs periodically. With additional responsibilities, you can enhance your term insurance and mediclaim cover and also add a super top-up plan. The next stage is Saving. When you are on a secured footing, you start saving for primary goals like your child’s education, your retirement, and probably a second home. Here, based on your investment horizon, consider products that help you secure these goals, even in your absence. Ensure that you nominate your dependents and that they are aware of all your financial assets, documents, and plans. The top of the financial planning is about Investing. With surplus cash, you can invest in asset classes like stocks, real estate, commodities, etc. As you save more, increase your investments in equity to beat inflation in the long term. When you near your goals (like retirement), reduce equity allocation and move to safer avenues like bonds and fixed return instruments. For investors it is highly beneficial to know the difference between taxable and tax-free returns. If your income falls in the highest tax bracket, a 9 percent taxable return is not better than a 6 percent tax-free return. Insurance is one of the few surviving investment products (apart from Sukanya Samriddhi and PPF) which have the ‘EEE’ tax status, i.e. your investment, interest accruals and final maturity amount are all exempted from tax. Invest wisely to make the most of the available tax perks. Free Cheese in a Mousetrap! It is advisable, even for seasoned investors, to stay away from new-fangled and esoteric asset classes like art, wines, bitcoins, etc. While they seem to be offering extraordinary returns, most of these asset classes do not have regulated exchanges, making them highly risky. Also, if the returns sound too good to be true, they probably are. In case you are unsure about the entity, check on websites like Sachet (www.sachet.rbi.org.in) to learn if the company that you are investing in is registered with regulators like SEBI, RBI or IRDAI.